The restaurant industry is seeing signs of sizzle after some of the worst sales results in years. A positive fourth-quarter stunned industry watchers, as restaurants posted a gain for the first time in two years, according to Black Box Intelligence, which released fourth-quarter figures this month. The Dallas-based market research company says Western states had the strongest sales (2.04%). New England reported the weakest (-1.87). Overall sales were up 0.28%, the data showed. Warning! GuruFocus has detected 5 Warning Sign with DG. Click here to check it out. "We were surprised to see it,'' Anna Tauzin, a spokeswoman for the Austin-based Texas Restaurant Association told GuruFocus. "We expected a flat growth." All the buzz points to new dining concepts that are upending the way restaurants serve and deliver food. Most of the changes have been in response to the way Americans have chosen to access their meals and a demand for higher quality ingredients at reasonable prices without too long a wait. Fast-casual refers to the style of restaurant that typically is as fast as fast food, and includes ordering systems like fast food (no waiter to serve you, you order at counter or at a kiosk), and the food tends to be healthier and higher quality. One of the first versions of this dining concept is Chipotle Mexican Grill (CMG). 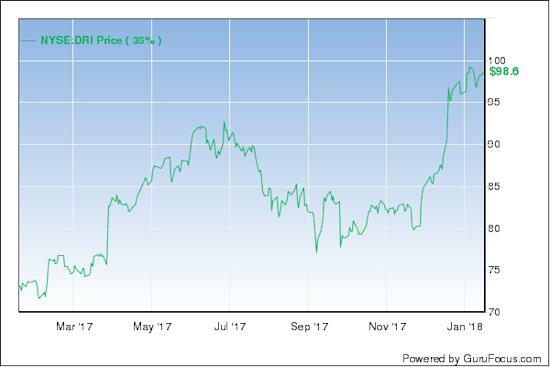 While the company's share price dropped last year after reports of food poisoning, guru investors like Bill Ackman (Trades, Portfolio) believe the company's long-term growth opportunity is one of the most attractive in the industry. Guru investors like Ruane Cunniff (Trades, Portfolio) and Joel Greenblatt (Trades, Portfolio) have positions in the stock. And GuruFocus shows the company's financial strength, profitability and growth is 9 out of 10. Early Tuesday, Chipotle shares were priced at $327.99, up 0.2%, according to GuruFocus. 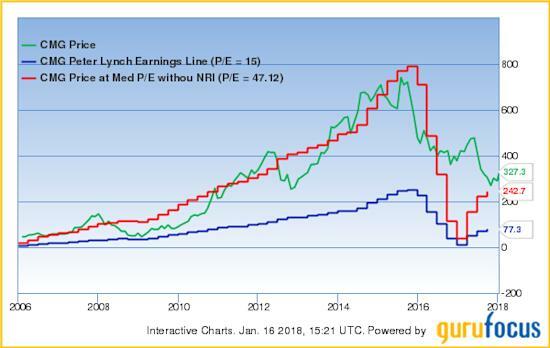 Meanwhile, the Peter Lynch chart shows the stock is overpriced. Its median is reported as $77.30 a share. Traditional fast food restaurants, like KFC (YUM), are trying to shift to the fast-casual style at some of its locations, by offering a menu of flatbreads and other healthier choices. A choice of guru investor Joel Greenblatt (Trades, Portfolio), Yum Brands Inc. (YUM) is the global operator and franchisor of the Pizza Hut, Taco Bell and the KFC restaurant brands. GuruFocus reports it experienced a 265% revenue growth rate in the last year. The company has a market cap of $28 billion, and a price-earnings (P/E) ratio of 25.34, higher than 63% of its competitors. Early Tuesday, it was selling for $83.87 a share, up 0.3%. The Peter Lynch chart shows the stock is overvalued. The median price is $49.20 per share. This is just a fancy word for delivery, takeout or catering. A lot of restaurants that have never delivered are now doing so. And the ones that have done it for years are steps ahead of competitors. One example is Domino's Pizza (DPZ). At a price of $211.37 a share, the stock was up 0.1% on Tuesday. GuruFocus ranks its financial strength at 4 out of 10 and its profitability and growth at 5 out of 10. Guru investors like George Soros (Trades, Portfolio), Ken Fisher (Trades, Portfolio) and Joel Greenblatt (Trades, Portfolio) own shares in the stock. 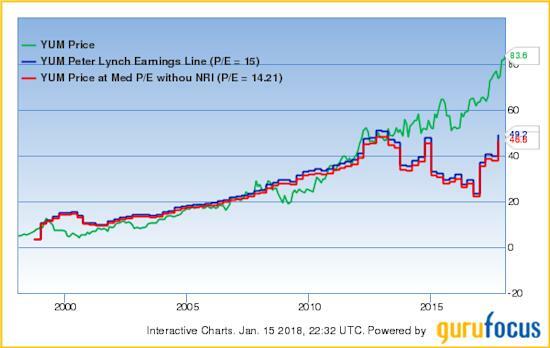 The Peter Lynch chart shows the stock is overvalued. The median is $78.60. The term refers to restaurants that offer a fine dining atmosphere with a price point under $10. One example is Souvla, a Greek restaurant with locations in San Francisco's Hayes Valley, NoPa and Mission neighborhoods. Investors will want to watch out for these new dining experiences as they are expected to pop up around town in the months to come. Casual dining venues like TGI Friday's have fallen out of favor in recent years, but casual dining hasn't gone out of fashion altogether. 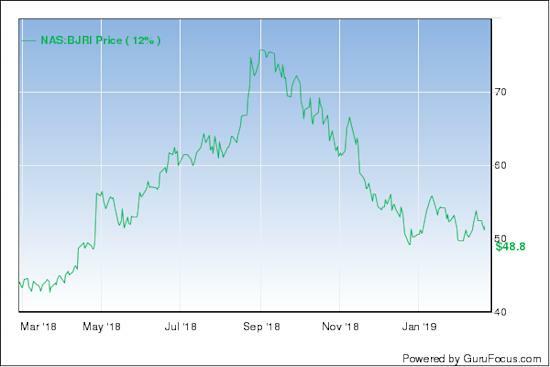 BJ's Restaurants Inc. (BJRI) is a stock analysts have preferred. Early Tuesday, it was at $37.65 a share, down 0.13%. The chain has a financial strength of 6 out of 10 and a profitability and growth rating of 8 out of 10, according to GuruFocus. 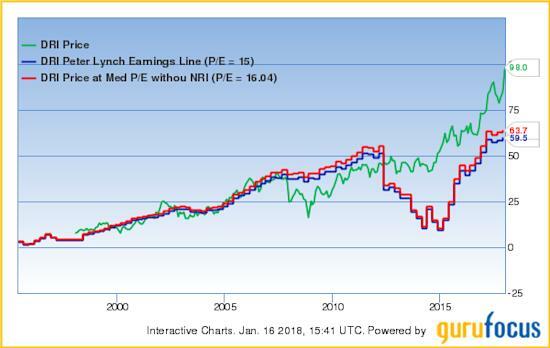 Its price-earnings ratio (P/E) is 24.80 or higher than 77 percent of its competitors. 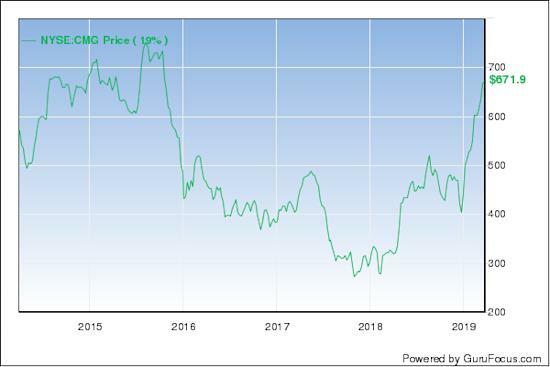 The Peter Lynch chart shows the stock is somewhat overvalued. The median is $22.80. The Orlando-based Darden Restaurants (DRI) is another multi-brand restaurant operator that continues to draw customers. It operates Olive Garden and several others. Darden has also drawn guru investors, including Joel Greenblatt (Trades, Portfolio), Jim Simons (Trades, Portfolio), Lee Ainslie (Trades, Portfolio), Jeremy Grantham (Trades, Portfolio), Steven Cohen (Trades, Portfolio), Manning & Napier Advisors and Caxton Associates (Trades, Portfolio). On Tuesday, the stock was up 0.55% to $98.56. It has a financial strength of 6 out of 10 and a profitability and growth of 7 out of 10, according to GuruFocus. 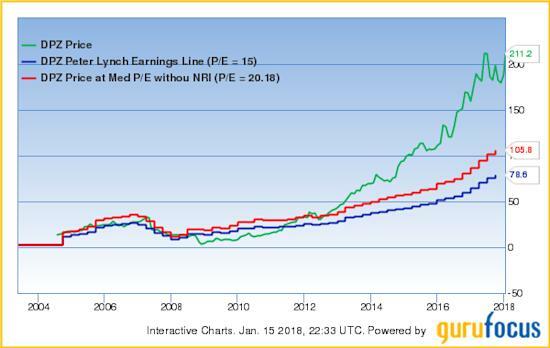 It is also overvalued, according to the Peter Lynch chart. The median is $59.50.